Big Finish: THE NEW COUNTER-MEASURES Series One Review | Warped Factor - Words in the Key of Geek. Tony gets his flares on. In the geek community, those three letters stand for a very particular kind of geeky drama from the Sixties and Seventies, and merely listing some of the company’s successes makes geeks of a certain age nostalgic for an era of bad clothes, action heroes, societal sexism, and convoluted Earthbound sci-fi or espionage plots, all thwarted by particular, special people. ITC was the company that brought us The Saint, Randall and Hopkirk (Deceased), Department S, The Baron, Jason King, Thunderbirds, Captain Scarlet, The Persuaders, The Prisoner and more. Counter Measures always had a foot in this populist adventure camp, while having its other foot more or less firmly in the rather more esoteric and thinky Doctor Who/Quatermass camp. Over four box sets, Big Finish established the team from Doctor Who’s Remembrance of the Daleks in an exciting, mostly plot-driven series evoking that populist sci-fi of the Sixties. Then it blew up most of the team, waited a decade of in-universe time and brought them back, a la Avengers, as The New Counter Measures – something of a stretch when all four main characters are the same. The Newness here involves a new decade, and a slightly more ‘superhero’ vibe, as they now have funding, status, and a secret base in the Post Office Tower, rather than working out of Whitehall. The one-off adventure that brought the Counter Measures Group out of the cold and rebooted them in this new Seventies form, Who Killed Toby Kinsella?, established the reasons why they had to be ‘dead’ for a decade, and set them up in this swanky, full-colour version, ready to take on the Seventies. 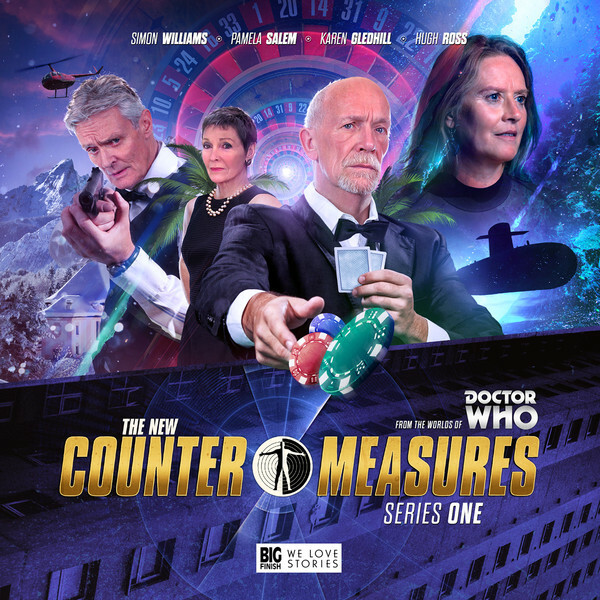 The first thing to say is of course it works – Big Finish is well-versed by now in getting a mood and a dramatic vision right on audio, and it’s chosen writers for the first New Counter Measures box set with more than enough chops to deliver the ITC vibe without going full Seventies Chauvinist. There are four stories here, and they each have a very distinct style and tone that could be plucked out of any Seventies ITC series. There’s not much by way of arc across the four episodes, but that again underlines the idea of Counter Measures as a great missing ITC show, with each episode for the most part telling a standalone story. The main stars have had four series of working together, to develop their character interactions in varying combinations, and the writers too have had time to see what works, and are able to push some envelopes now that they wouldn’t perhaps have had the courage to do with a fledgling cast. So The New Counter Measures #1 delivers an anchoring sense of familiarity in the cast and the way they work, leaving the storylines themselves to push the originality forward in its new Seventies style. It's a proper old-school harrower that has little by way of introduction, Gilmore falling in with some bank robbers, and forgetting the rest of the team. As an opening shot in The New Counter Measures, it’s high class adventuring, but the extra depth of philosophical horror and the jeopardy of increasing instability gives the story an added dimension that makes Nothing To See Here a cracking beginning. Troubled Waters, by Ian Potter, explores some similar themes, but takes them in a whole new direction – control of your own mind and the reality it feeds you is established as a necessity in Nothing To See Here, while Troubled Waters takes us into a tense, underwater adventure of creepy soundscapes, abandoned submarines and psychic shenanigans, to explore the notion that people and military outfits might invest serious time and money into research to change people’s minds, to infiltrate them at the perceptual level and make them do incredible or unspeakable things. There’s a very different tone to Troubled Waters, the claustrophobic sense of being trapped in a tin can underwater coming palpably through the sound design, and Potter’s script making what later certainly became a viable military option (see The Men Who Stare At Goats) feel like it belongs well and truly in the world of Seventies ITC-style adventure stories. There’s perhaps slightly more realism than such ITC dramas would have bothered with – many bulkheads and airlocks need to be negotiated, for instance – but the pay-off is suitably whacky and creepy, with at least half the Counter Measures team succumbing to illusionary created realities at the expense of their own free will. If Nothing To See Here gives us philosophical horror, Troubled Waters balances the equation with some creepy, sweaty, damp-collared grimness in a claustrophobic soundscape from which there’s only one escape. The Phoenix Strain, Christopher Hatherall’s episode, is more about the dashing about than the sweaty terror, as Counter Measures try to prevent a potentially deadly outbreak of a strain of chemically engineered bird flu. Take Hitchcock’s The Birds, give it a healthy injection of scientific rationalism and retrospective referencing, then make it deliberate – Hitchcock never gives a clear reason why his birds go nutsoid – as an offshoot of a chemical weapons programme, and you’ve got Hatherall’s premise. There’s a touch of early Avengers in this one too, the Counter Measures team each having a strand of the investigation and containment operation to focus on, and a little Survivors to boot, with the double threat of psycho birds and the more real world relatable potential deadliness of bird flu having transferred to the human population. The Phoenix Strain pushes its scares up and up, with some classically structured bird-death scenes ramping up from ‘Aww, cute little birdies’ to the wingbeats of doom, and ends up with Gilmore co-ordinating a mass evacuation of a London train station, and the deployment of poison gas! That’s the overriding sense of The Phoenix Strain – of a crisis springing up quickly, spreading rapidly to a tipping point of threatening life as we know it, and of Counter Measures standing between us and our fate as bird food. If Nothing To See Here’s the philosophical terror tale, and Troubled Waters is the sweaty creepy claustrophobic take on dark dedication, The Phoenix Strain is the pulse-pounding disaster movie of the box set. As a collection of ITC tropes, New Counter Measures #1 wouldn’t be entirely complete without the ‘undercover glamour’ episode, and that’s where John Dorney comes in, with A Gamble With Time. The casinos of Monte Carlo are our setting (not Vegas, you notice – back in the day, Monte Carlo was the place to go to meet proper old school villains) for arms dealing, a black market in alien artefacts, and that most scandalous of Sixties and Seventies tropes, a thoroughly black-hearted aristocratic woman! Carolyn Seymour, more familiar to Big Finish listeners as Abby Grant in Survivors, lifts Dorney’s creation high as Lady Suzanne Clare, while the question of someone who wants to sell a time machine means Counter Measures has no option but to step in. There’s quite a bit of toing and froing with a man who seems to be in two or three places at once, but it’s Seymour as Clare who establishes herself as the potential Moriarty to Sir Toby Kinsella in this Seventies iteration of Counter Measures, proving she’s at least a couple of steps ahead, even of people with a time machine to sell, and of our team, with all their tricks and doodads. This one could run and run, and immediately we get finished with A Gamble In Time, it makes us anticipate the next time Kinsella and Clare lock horns. The New Counter Measures had something to prove going in, namely that shifting the team forward a decade was more than a gimmick. Here it establishes itself with a solid range of stories, written by writers on the top of their game, and a team that gets better and better the more work they do together. Definitely worth the money, whether or not you’re a fan of the classic ITC output. Counter Measures – it’s a Seventies thing now.